The emblematic Academia Collection offers endless opportunities for stylistic evolutions and the introduction of the new Blackstream line reminds us once again of the creative power of the DeWitt Manufacture. The Blackstream inspiration is to be found in the sporting world and is designed for a young, dynamic and sporty masculine clientele. In that respect, a streamline spirit of modern and fashionable velocity was instilled into this creation. In the previous Chronograph model of the Academia collection, time was displayed in a rather poetic way through the rotating movement of a fan-shaped hand over the seconds dial. Today, in the new Academia Blackstream Chronograph, the sequential seconds were replaced by classical seconds on a counter at 9 o’clock. A second counter, visually interconnected to the first one and positioned at 3 o’clock, plunges us once and for all into a sports car universe, as we now face the eye-catching speedometer of a racing car. 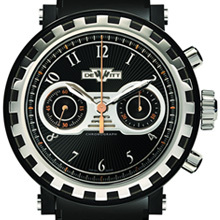 The “radiator-grille” connecting these two subsidiary dials in the center of the watch further reminds us of the mechanical components of a motor. The final touch to its character is provided by the refined sunray pattern that further enhances the sense of speed and gives the impression of travelling across time. 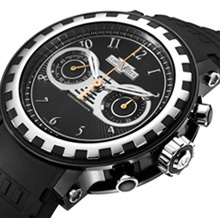 The Blackstream Chronograph beats to the rhythm of a self-winding mechanical movement and has a power reserve of 48 hours. Its 44 mm round case is made of Grade 5 Titanium, black PVD and black rubber. The traditional 24 imperial columns obviously still adorn its flanks, however in a more discrete manner. The bezel provides a stunning contrast with the “full black” spirit of the watch, as it does not reflect the colour of the columns. The movement and the quality of the finishings can be observed through the sapphire crystal back. With its new Academia Blackstream Chronograph, DeWitt has simply let its stylistic perception of dynamic masculinity be expressed. A subtle alloy of black elegance and trendy style. But with a sporty and streamlined twist. Hands:		Hours and Minutes: Open-worked hands in the shape of two-		edged swords.